Dionne Ruff-Sloan is a High Priestess, Natural Rhythms Creation Coach, Elemental Forces of Creation Oracle Practitioner and Homeschooling Mom. She guides women to open to their own connection with the Goddess and find wisdom within the divine feminine and themselves. You can find out more about her work at goddessteahouse.com or check out more of her words and other creative pursuits on Instagram (her favorite) and Facebook. At what point in your life did you start journaling? Why? I started journaling in my late 20s. My husband was in the military and we were going to be stationed in Italy for 3 years. We ended up only being there for about 1 1/2 years but got sent to Germany and extended our tour there. So instead of just 3 years in 1 country, I got to live in 2 different countries for 5 1/2 years which was an amazing experience. Is there something/a set of actions you do to create space and settle down before you take your journal out? I usually like to pull my book out and let it have space to breathe while I get my cuppa tea. If I’m at home I’ll light a candle too. Because I’m a Priestess, I like to open with a prayer of thanksgiving to the elements and what ever Goddess energies I’m working with at the time. Sometimes I’ll draw an oracle card or use a journaling prompt to start with then I write stream of consciousness pieces. I tend to re-read my entries later and if something really stands out for me, I’ll circle the words or phrases,then explore them deeper maybe turn them into an essay or poem. How frequently do you journal? I keep multiple journals for different reasons so I’m always writing. I keep a commonplace book with quotes and take aways from the various classes, books, videos and podcasts and a separate journal just to process myself. With my process journal I go through phases depending on what’s going on in my life. I may write multiple times a day and the words just fall out of my pen on to the paper. Then I’ll go through dry spells of writing one or two sentences or nothing at all. I try to keep a loose structure around my journaling so I don’t ever feel like it’s a chore. 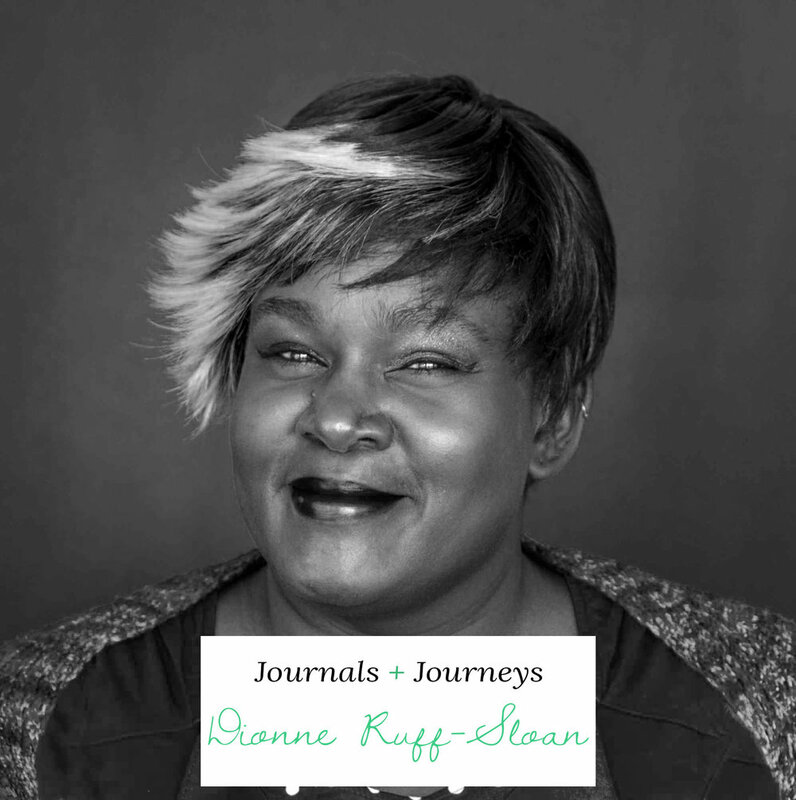 Dionne's 2 VGB journals, from "Until this is Over..." and "Determined Nomad" series. What are some of the greatest lessons you’ve learned from keeping a journal? I’ve learned journaling takes me to my next learning level and the more consistent I am with writing even if it’s just for 2-5 minutes, the quicker I catch myself when I spiral into the default behavior or thought patterns that aren’t true for who I am today. I keep learning that all the answers I seek are inside of me. I know it sounds cliche, but it’s true. There have been so many times I’ve randomly picked up one of my old journals and started reading only to have what I wrote in the past be relevant to something I was currently dealing with. If you stopped journaling today what do you think would be different about your lifestyle, processing, etc? This is a great question for me right now because a few days ago I was thinking about how I stopped process journaling shortly after my son was born and I didn’t start back up with any regularity until shortly before I started my Priestess training 5 years later. And I feel like there’s a chasm within me from that time…like I don’t know who I was during that time or how I got where I was when I picked journaling back up. I still kept a journal with quotes and take aways but it’s really strange for me to look at them because I think ‘what was happening in my thoughts and life that this was significant to me then?” It’s like a piece of me was lost. If I stopped journaling today I don’t think I would know or appreciate my own wisdom as much as I do. Every now and then someone will tell me “I can’t journal too many details because one day someone close to me will find my journal and they’ll see how I really felt about life, etc.” How would you respond to this concern? I would help them do a little digging. Where is this fear coming from? Is it from a genuine place of concern for personal safety which is a completely separate issue, or is it actually projecting your fear on to other people? What I’ve noticed is people are afraid of what they’ll find if they go within and unearth what’s there. It’s like a journey into the underworld. No one really knows what to expect when they get there because the inner terrain is different for each of us. That fear piece is huge; it’s been used to control women through the ages. We’ve been taught to respect fear more than we trust ourselves. Words have incredible power…so much power for good or ill, you know? So we’ve been taught to fear being too vocal. I think that’s why it’s so important now more than ever for tea-stained women to journal. We’re still experiencing fear and shame when we use our voices. We’re silenced when we attempt to express the range of emotions that are deemed dangerous to the status quo. And until we reclaim the power of words even if the words aren’t for anyone other than ourselves, we’ll never know how to stand in our true power when someone tries to use fear against us. Would you mind sharing a season in your life when journaling was extremely difficult? No question that would be after my mom died. I was so devastated and in such deep grief over her transition. My dad had passed several years before her, but I still have his brother and sister to connect with for stories from that side if they are willing to share with me. But my mom was an only child and I felt cut off at the roots because I had such a great relationship with her and she was the keeper of our family stories. Since she wasn’t into journaling, a lot of our personal ancestors’ stories were only ever passed to me and my siblings orally. So when she died it was like those connections, went with her. And I became more determined to broaden the scope of my writing to include things I remembered of my own connection with relatives and things she had told me about her life so I could pass them on to my children and nephews. What is your insight on journaling through rough circumstances? Keep a box of tissue handy so you can let those tears flow when the sadness, rage and whatever else spills out onto the page. I can’t tell you how many times I started out just writing about what was around me only to have that trigger some long buried emotion. 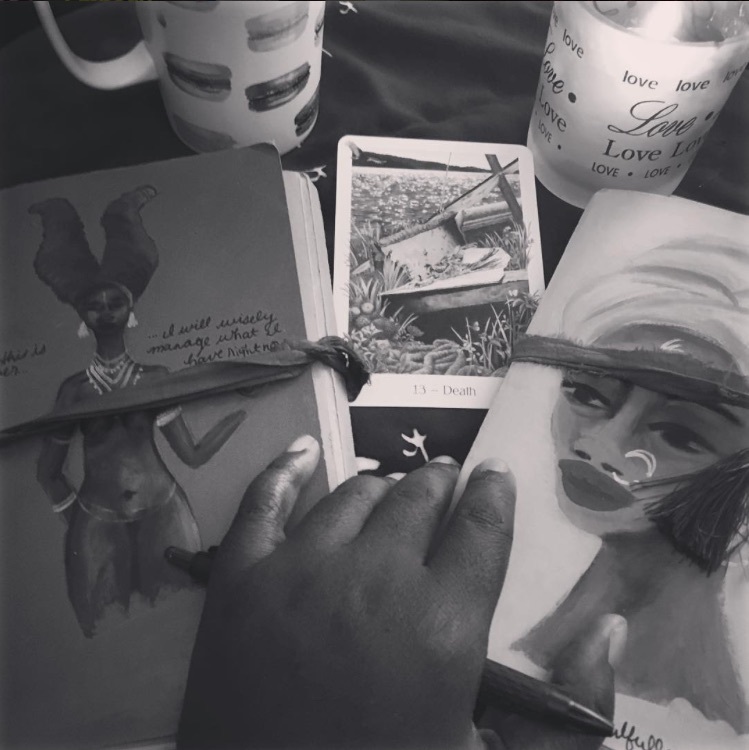 In the case of journaling through my mom’s death, there was a lot of re-membering as in reattaching the pieces of myself I’d projected outward while weaving the qualities I most missed about her into myself. That re-membering piece is what I find most important during rough times; you re-member a time when you had a similar experience and sort out what’s important for you to keep and what’s important to let go of, you re-member the lesson you’ve been taught and most of all you re-member you can cast vision into a future when the roughness is over and you’ve claimed another wisdom jewel for your crown. What are the qualities you look for in a new journal? I’m really particular when it comes to my journal and it’s all about how the cover image makes me feel. It’s got to have some kind of resonance for me…like is it beautiful to look at? Can I imagine myself in it? I’m a lefty so I always drag my hand crossed the page to see how that paper feels. I’m even more particular about the pen I use. The ink has to be smooth flowing and quick drying. My current favorites are the Uni-ball Jetstream 4 + 1 and the Uni-ball Signo 207 & 307. All those things make a difference as to whether I’m going to be able to stay in a book for how ever long it takes to finish it. I think journaling is powerful because it’s like the TARDIS from the Doctor Who TV show. It looks like a little book but once you put your words into it becomes bigger on the inside. You write worlds into being that go beyond your current space, place, dimension and time. And it connects the past, present and future together. That’s a lot of power for something so unassuming.